Dr. Tan Tin Wee’s resume is that of a quintessential renaissance man. A trained molecular biologist, he ended up introducing the Internet and the Web to Singapore. He led the first Internet service provider, Technet Unit, National University of Singapore (NUS), for academia and research in the country. His innovations made the Internet accessible to people using non-Latin scripts around the world and facilitated global sharing of scientific information. A roving intellect led him to keep pushing the boundaries of technology, streaming live video from Singapore around the world, while the Internet was still in its infancy and developing prototypes for online stock trading and e-commerce. He was an inaugural inductee into the Internet Hall of Fame in 2012, along with the Fathers of the Internet, Vint Cerf and Bob Kahn, the father of the web, Tim Berners-Lee and US Vice President Al Gore. He was the only Singaporean and one of three Asians in this illustrious group. 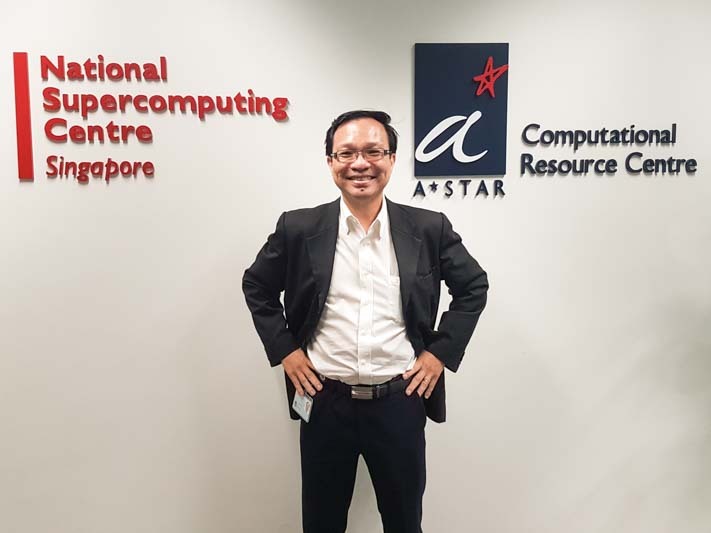 At the moment, among his several positions is the role of Director at the National Supercomputing Centre (NSCC) in Singapore. In the first instalment of this two-part interview, we talk to Dr. Tan about his accomplishments during the early days of the Internet. In the second part, he tells us what is engaging his mind at present and how he visualises the not-too-distant future. When asked him about his milestones, Dr. Tan summarised his achievements saying, “At a personal level, it’s about making a difference in the way I think about information. From the perspective of my research community, the most important achievement was enabling researchers to search scientific data online with ease and convenience, by creating some of the earliest online biological databases." Dr. Tan played a key role in ensuring that scientific information, data, literature and software was available on the web. Describing the paradigm shift he said, “You no longer had to go to a physical location in order to interrogate databases and retrieve information.” The community also acquired the ability to publish information online and share it with anyone around the world. As a molecular biologist in the department of biochemistry at NUS since 1990, he pioneered the use of biological databases, which were searchable using a text indexing system called WAIS (Wide Area Information Server). It was subsequently combined with the Gopher Protocol developed at the University of Minnesota, that allowed distributing, searching, and retrieving documents. In 1992, the first Gopher website was set up in Singapore. In September 1993, he set up Singapore’s first website, which was a biological database, biomed.nus.sg (bic.nus.edu.sg today). This led to the establishment of the bioinformatics centre in 1996. Dr. Tan was the founding director. Dr. Tan was also involved in setting up mirror sites, because all the data sites back then were largely in the west. Collaboration with http://bio-mirror.net/ became another key milestone, in 1998. It allowed researchers in the region to easily access the data. Dr. Tan also helped to create the Cyberspace Hospital for Prof K.C. Lun (former President of the International Medical Informatics Association). It provided access to global health information resources on the Internet using a virtual hospital setting, foreshadowing the wealth of online hospital resources and medical information today. Before 1995, non-Latin characters couldn’t be displayed on the Internet’s Web browser graphical interface. Only ASCII characters could be displayed. As a result, a large percentage of the world’s population, who use non-Latin scripts, couldn’t publish information in their own language script on the Internet. Different communities adhered to their own encoding systems, for example, the Japanese Shift JIS and the Chinese GB. Dr. Tan and his team at the Internet Research and Development Unit (IRDU) in NUS were involved in the early days of adopting Unicode as a standard. At that time Unicode was in its infancy and few realised its potential in handling text of almost all of the world&apos;s writing systems as it does today. In 1994-95, they displayed Chinese characters dynamically on the World Wide Web. This was followed by Tamil. In 1995, the team produced a four-language website, displaying the Singaporean pledge in four official languages, English, Tamil, Chinese and Malay. In 1996, Dr. Tan worked with Prof. V.K. Samaranayake, considered the "Father of Information Technology" in Sri Lanka and Prof. S.T. Nandasara from the University of Colombo, Dr. Tan helped create a trilingual website, www.lk, which is still in existence today. The work was published in INET&apos;97, in a paper entitled &apos;Trilingual Sinhala-Tamil-English National Website of Sri Lanka&apos;. There was still the barrier of domain names. The Internet disenfranchised were being forced to key in English characters, which they could hardly recognise on the keyboard, in order to access a website in their own language. It took over a decade for standardisation and adoption because the western community had objections regarding the necessity or the methods. The delay forced communities to learn English. It turned out to be an inadvertent benefit, as English is effectively the global lingua franca. Finally, after more than a decade of lobbying, this domain name standard has been adopted by ICANN (Internet Corporation for Assigned Names and Numbers) in support of their slogan, “One World. One Internet”. Dr. Tan was also involved in introducing the Internet to the disabled. In line with his inclusive vision of the Internet, he was determined to ensure that no one got left behind in accessing the benefits of the online world, just because of a physical impairment. He personally set up the modems, routers and network cards for the Singapore School for the Deaf (SSD), the first primary school in Singapore to get Internet access, because he believed in early intervention. Later other disability schools also joined in. Seeing a Braille printer at the Singapore School for the Visually Handicapped, Dr. Tan tried to take Project Gutenberg’s treasure trove of digital books and automatically map the text and translate into Braille, without necessarily having any human intervention. He was also appointed to the board of International Centre for Disability Resources on the Internet (ICDRI). On 9th of August, 1994, the National Day parade in Singapore was broadcast live to students in Tasmania, Chicago and Cambridge. After watching the parade, they were interviewed live for the 9’o clock news. The live TV feed from Singapore Broadcasting Corporation (SBC), was streamed using multi-casting and uni-casting. Back then, it was unprecedented to have video interviewing over the Internet. At that time, only NASA streamed live video via CU-SeeMe for public consumption. Even BBC was not videocasted. Dr. Tan also worked on developing an online simulated stock exchange for Singapore, Project StockNet, in which they collected data from the Stock Exchange and converted it into a stock trading engine. This StockNet project was published as conference papers in 1995 and 1997. In 1996, Phillip POEMS (Phillip&apos;s Online Electronic Mart System) was launched. Charles Schwab in the US later came out with their own web trading solutions. Adding to the long list of milestones, Dr. Tan worked on a project for an e-commerce prototype. They developed an online pizza ordering system, using Common Gateway Interface (CGI). GIF stacking images were used so that people could order the toppings. The ordering system was connected to a fax that would send a request to deliver your food to any location. Dr. Tan was overseeing Singapore&apos;s first ISP, called Technet, for research and academic use, as the third Head, from 1994 to 1995. He oversaw its commercialisation in 1995 to become Pacific Internet under Sembawang Media. He led Technet to offer the first graphical interface access using SLIP and PPP technology before Windows 95 provided a built-in TCP/IP stack in the operating system. Today Singapore is at the forefront of digital transformation, leveraging technology to transform society and individual lives. In the next part of the interview, we look at Dr. Tan’s vision and plans for taking his research community and his nation to the next level.